For the last several weeks, I’ve been walking around feeling like a fraud. 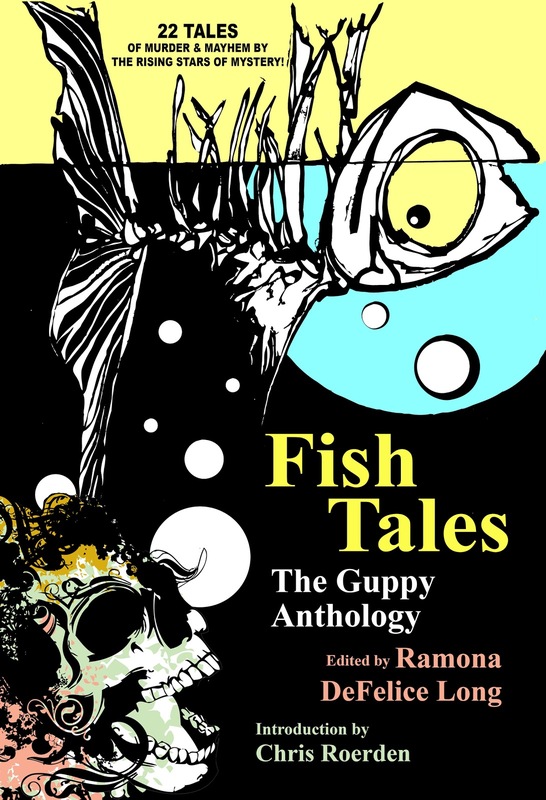 Fish Tales: The Guppy Anthology was out. I’d seen the ads. I’d posted about it on Facebook. I’d tweeted about it and blogged about it. I even had a copy of it on my Nook. Yet, it didn’t feel real. Other authors’ books on the Nook felt real. But not mine. Other people told me they’d received their trade paperback versions of it, so I knew it was out there. Well, part of me did. I decided I’ve gotten too good at lying to myself. Oh, I’m a lousy liar to anyone else. But I write fiction, so in sense I tell lies every time I sit down to work. And if what I write is any good at all, I have to believe it. I have to be convinced that my characters are flesh and bone with secret pasts. They have to bleed real blood and cry real tears. If I don’t believe that, how can I expect my readers to believe it? So I live in a fantasy world with my make-believe friends. And it’s okay, because I’m a writer. But I started to think this whole Fish Tales thing was yet another figment of my fertile imagination. Or maybe a dream. After all, I had no hard evidence that the book existed anywhere other than in my mind. Until Monday afternoon when I drove to Mystery Lovers Bookshop in Oakmont to pick up my copies of it. I pulled one out of the box and checked the contents page. Sure enough, there was my name and my story listed. I thumbed to page 137 (yes, I have it memorized. Heck, I may play that number in the state lottery!) and discovered it hadn’t all been a cruel joke. “A Murder Runs Through It” was there right before my eyes. 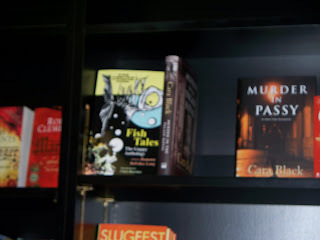 And more copies of Fish Tales sat on the store’s shelf. Sorry for the fuzzy picture. I think my hands were shaking. Feeling a little bit less like a fraud, I headed down the street for some supper at Casey’s before making my way to the Oakmont Library to see one of my favorite people in the world, Lisa Scottoline…who also just happens to be one of my favorite authors. I was early, so I set up camp front row and center with my fellow Sister in Crime and former Working Stiff Laurie Kassim, who whipped out her copy of Fish Tales (did EVERYONE get theirs before I did???) and asked me to sign it. Now, this is a strange and wonderful thing, when someone wants you to sign your name on something other than a check or a contract or a loan application. I like it! 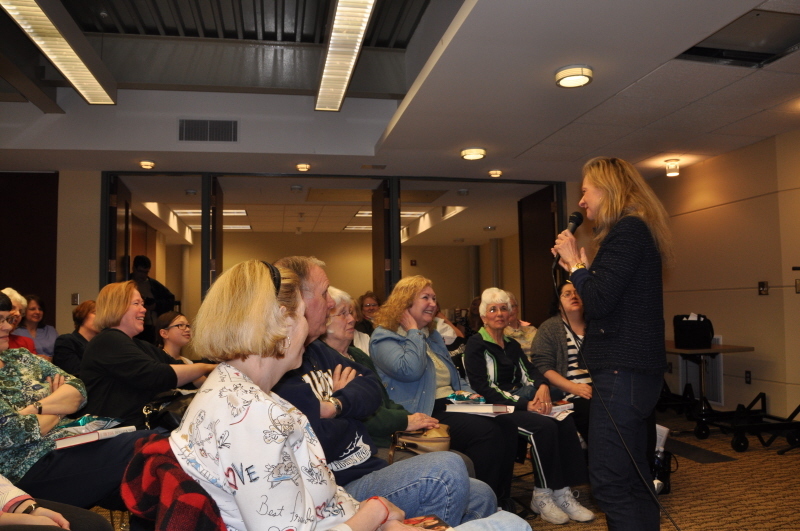 Lisa came out and entertained a packed house—ahhh—library with stories about life and family and what brought her to write her latest thriller Save Me. I have a feeling once I start it I’m not going to sleep until I finish it. Lisa’s writing has that effect on me. More than once, I’ve blamed her for my sleep deprivation. After her talk, I waited until the very end of the mile-long line of fans waiting to get their books signed to present her with a copy of Fish Tales. I figured she’s been so supportive of me (she’s always giving me names of agents to send my manuscripts to! ), I wanted to give her a small token of my appreciation. 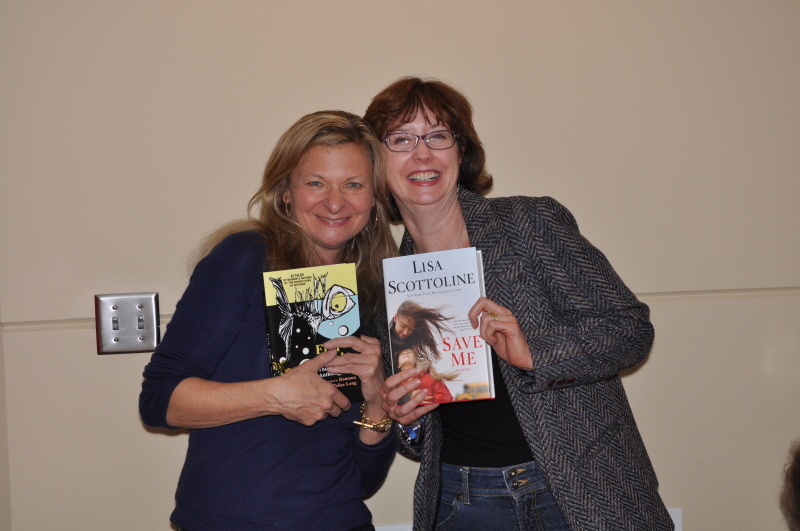 Besides, it’s really cool to be able to sign a book to Lisa Scottoline! And a little cross promotion never hurts. Okay, I really hope this isn’t the peak of my career—I still want to get a full novel (or two or three or thirty) published—but Monday night was definitely a high point. And with all the rejections and disappointments in this business, we have to celebrate each success in whatever form it takes. And, for what it’s worth, I no longer feel like a fraud. I love this. And silly me, it brought tears to my eyes. And you WILL get those novels published! You're too good a writer not to! I have a copy of Fish Tales on my Kindle, but I'm buying a hard copy, too, the next time I'm at MLB (which will probably be 5/2, the FOM). I'll definitely have you sign it! Practice your autograph, Annette. That's all I'm going to say about that. Ah, geez, you guys. You both bring tears to my eyes, too. Joyce, your turn is coming. You have to know I'm one of your biggest fans. Ramona, Fish Tales is more your baby than it is ours. Your hand touched all the stories and made each and every one of them better. I learned so much from you and from working with you, and my writing has improved immensely as a result. By the way, I neglected to give photo credit (for the ones I'm in) to Steve Bucci, official photographer of Mystery Lovers Bookshop. So exciting! Congrats Annette!!! And the photo with Lisa is PRICELESS!! Brava, Annette! I LOVED your story, and am eagerly awaiting more from you. Good job, Ramona, too. I'll never forget opening my first box of books with my name in the author's spot on the cover, nor will I forget the first time anyone asked me to sign one. It's surreal, isn't it? I remember thinking, "ME? You want ME to sign a book? Oh, yeah, I'm an author!" More like this to come, Annette, I just know it. Joyce, I'm also going to be at FOM, and plan to buy a hard copy of FT, as well. I'd love to meet you guys in person. Congrats, Annette! Looking forward to getting a copy, and getting it signed, at FOM in May! Karen, surreal is definitely the right word. But I like it! LOL. I'm looking forward to seeing everyone at the Festival! Congratulations, Annette. Not to dis e-publishing, but there's something about a book you can hold in your hand that makes it real. Jennie, I intend to add a page of photos to my website after the Festival (figure I'll get a few more there and will only have to update the website once). As for the blurb, she's already offered. Squee! Alan, it'll be good to see you again! Gina, I so agree. My Nook is "okay" but I do love the real thing. Yay! We'll get to meet Karen! Annette, we should try to get a group photo at the FOM with any authors/commenters who've been on Working Stiffs. We could use a few photos on the front blog page. I am so proud of you. Light the way for yourself and everyone to follow. May your fingers delight in each book you sign. May your heart always remember the flutter of joy when you saw your book in the window. And may your muse be delighted with this visible sign of homecoming. We're on our way, Annette. Glad everyone is enthused about the anthology. I definitely put it on my website, too. Boy, there is nothing like seeing your book on a shelf, I get all weepy seeing it on a seller's table at a con. I'm so proud of all the Gups who dove into this book, but I'd be lying if I didn't say, I'm particularly anxious to Get my hands on A MURDER RUNS THROUGH IT. Even if Robert Redford and Brad Pitt don't make surprise appearances. It's a great story, and I'm a huge fan of Annette Dashofy. I don't even have to say good luck. It's a matter of time. Congrats, Annette! You sooo deserve the excitement! I'm looking forward to getting a signed copy. I'm back...had to go teach yoga and then stopped to buy some celebratory chocolate at Sarris'. Yum. C.L., that's lovely! I may have to print that out and post it above my computer. Pat, I'm probably going to get a bit choked up when I see it at the Festival of Mystery, too. Thanks, Carol. I'd be honored to sign one for you, Madam President. Cheers to you, Annette! You deserve this success and much more besides! Thanks, Cheryl! You're having a pretty good year, too! Congratulations, Annette! I came by here early this morning, read the post, then went right over and got the book for my Kindle PC. Told you that on FB, but forgot to come back here. Sigh. Glad I came back because I love everyone's comments! Especially Ramona's. Thanks, Paula. See you at the Festival, too! Working Stiffs are going to be taking over the place! It definitely is, Pamela. Thanks! I know how you feel; it still doesn't feel real to me, either. But it is! I've signed two copies so far, and have to get past the feeling that I'm inscribing a present more than autographing something that I wrote, that happens to reside between a front and a back cover. Diane, that's EXACTLY how it feels. Inscribing a gift. There has to be a better word than CONGRATULATIONS for your accomplisment. Your blog was terrfic too -- loved the shaking hands/blurred photo. Most appropriate and it speaks to the big moment. Keep practicing your autograph because this is just the beginning. Thanks so much, Phyllis! That means so much to me, coming from you. Congrats Annette I celebrate your success and persistence. 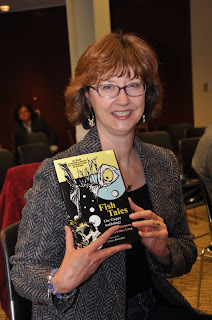 Look forward to getting my copy of Fish Tales autographed! 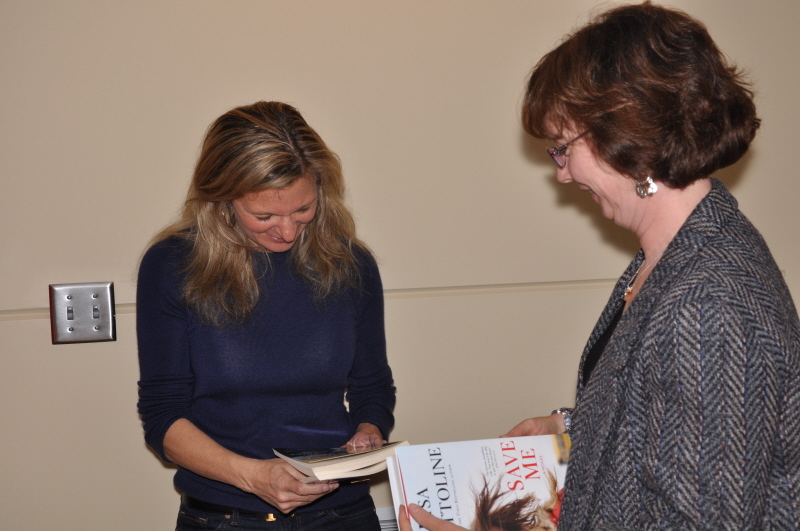 And I look forward to signing it for you, Andrea!